Presidential election results map. Red denotes those won by Eisenhower/Nixon, Blue denotes states won by Stevenson/Sparkman. Numbers indicate the number of electoral votes allotted to each state. This election was between Governor of Illinois Adlai Stevenson and General Dwight D. Eisenhower. Dwight D. Eisenhower won the election by 442 electoral votes. 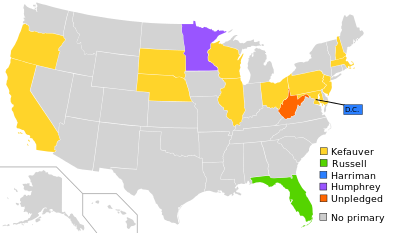 Adlai Stevenson got only 89 electoral votes. Incumbent President Harry S. Truman was eligible to run again because the newly passed amendment did not matter who was president at that time. Truman chose not not run so the Democratic Party elected Adlai Stevenson. Eisenhower was 62 when he won the election. This was the last time an older candidate was elected since James Buchanan was elected in 1856 at 65 until Ronald Reagan surpassed his age at 69 in the 1980 election. Notable candidate included General Douglas MacArthur as the Constitution. Barkley was 74 years old and not accepted by labor union leaders because of his age. Truman's running mate was going to be Senator Estes Kefauver, but he did not choose to run in the election. Truman's presidential disapproval rating was 66% at the end of his presidential term until decades later by Richard Nixon and later surpassed by George W. Bush. Kefauver won all but three primaries, but failed to win nomination No primary W. Averell Harriman Hubert Humphrey Estes Kefauver Richard Russell Jr.
Election results in these states were less than or ten percentage points. Colors represent the winning party, using the present-day convention in which red indicates Republican and blue indicates Democrat. ↑ Frum, David (2000). How We Got Here: The '70s. New York, New York: Basic Books. p. 7. ISBN 0-465-04195-7. ↑ Susan Page (April 22, 2008). "Disapproval of Bush breaks record". USA Today. Retrieved December 16, 2012. ↑ "The Presidents". uselectionatlas.org. David Leip. Retrieved 2013-03-02. This page was last changed on 12 February 2019, at 18:17.